Hello people!! 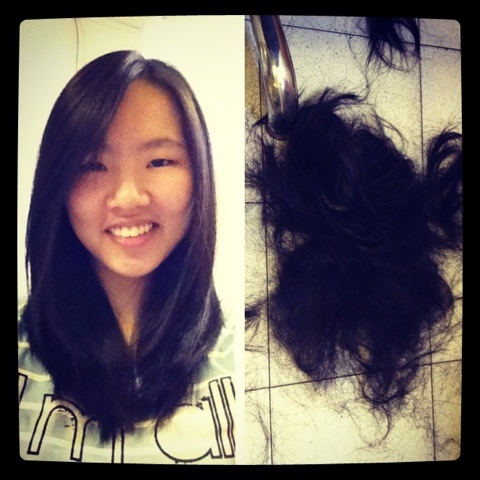 Just cut my hair yesterday. It's quite an extreme hair cut. My hair was so long that it reached my belly button. It was quite annoying because it always gets in the way every time i'm trying to do something eg. run, or even sleep (my hair has to be swept to the side of my pillow and i have to make sure i don't sleep at the edge even though i love to because my hair will touch the floor and i don't like that) and especially when i have my earpiece on, listening to music. I remember once I went out with earpiece, a sling bag and my hair u tied. Somehow, everything got tangled up :( it was so embarrassing! I was outside, near the bus stop and there were construction workers opposite the bus stop. It felt like they were staring and secretly lauging at me! Sigh..
No regrets, no regrets at all! My hair feels so light and it doesn't feel like my head weighs 10kg anymore! It's so easy to handle and wash now.